Since the bombs went off on Monday at the Boston Marathon, people around the world have been anxiously awaiting news in the case. Wednesday saw a bizarre cycle of reports and retractions about the identity and possible apprehension of suspects that left many frustrated with mainstream cable news networks. Meanwhile, many members of the massive message board Reddit used online tools to conduct their own manhunt. After authorities released photos of two suspects Thursday afternoon, things progressed rapidly leading to a car-jacking and a shoot-out and the eventual death of one of the suspects. With suspect Dzhokhar Tsarnaev still on the loose, an eager public was left to pursue other angles, often aided by online resources. Here are some of the most compelling narratives that we’re following at WBEZ (NOTE: We are reporting on these as activities, their claims have not been verified by WBEZ). Verifying the suspect’s social media accounts: NPR’s Andy Carvin worked vigorously to link a Twitter account to Tsarnaev and sifted through speculation based on that account’s tweets and profile image. Others sifted through a profile on VKontakte, a popular social network with Russian-speakers. Police scanner monitoring: As the dramatic scene unfolded in the wee hours of Friday morning, there weren’t many official channels of information available. There were, however, online streams of the Boston police scanner and plenty of eager Twitter users posting what they heard on them. Some longtime journalists were chagrined over disseminating unverified information, but participants in Reddit’s ad-hoc detective force transcribed everything they heard for hours. Boston Police went on to ask social media users not to post information they heard on scanners. 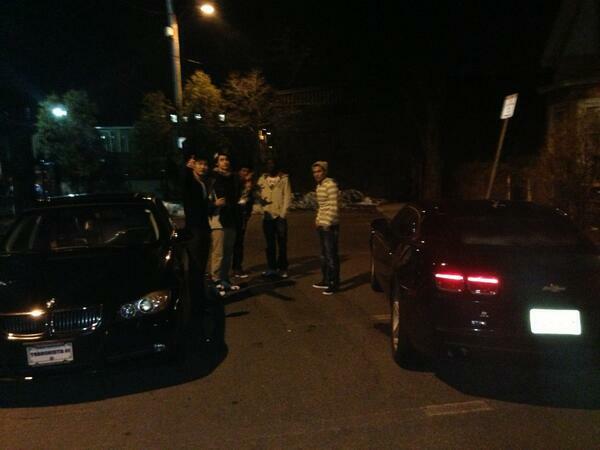 The effect of smartphone cameras: For residents in Watertown who woke to gunfire, Instagram was a popular outlet. Many posted surreal photos of SWAT teams and bullet holes in their residential neighborhood. Another chilling side-effect of the manhunt is that streets in the Boston area eerily empty today. NPR is collecting photos of that rare scene as well.